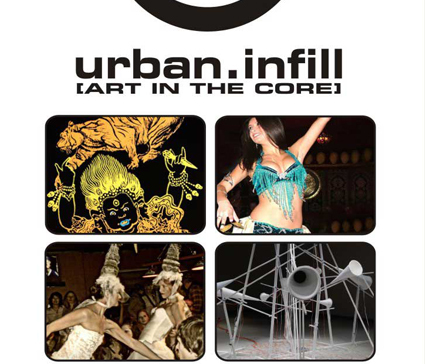 Urban Infill-Art In The Core, celebrating it’s 6th year; the next evolution of creative possibilities. The idea is to help revitalize our downtown core by capitalizing on assets of art and culture and linking and reinforcing connections through accessible empty spaces and existing arts, commercial business/social spaces. With vision and innovative arts and business we can fill up the empty spaces in our downtown and help to connect and create that unique niche of an urban arts and entertainment district. The projects comprised of multi-disciplinary and new media/multi-arts by national, international and regional artists will work to enhance our level of arts programming by involving all facets and mediums of the contemporary arts and involving innovative new media technologies. Premised upon the concept of creative cities partnerships we will utilize our multi-functional gallery spaces as a creative hub for generating collective/collaborative projects not only in our gallery space but in empty / underutilized / established / commercial / art spaces throughout the downtown north core of Thunder Bay. Re-discover your North Core Waterfront District through contemporary art! The projects begin January 21 with Derelicte 4 and continue through February and culminates in March with a flurried and frenzied art affair. The results of last years Urban Infill – Art In The Core projects were highly successful in terms of statistics and participatory results: 17 Art Projects, 350 multi-disciplinary artists (most regional as well as critically acclaimed national/international artists), 15 downtown locations, 150 volunteers, 35 businesses and an audience of 5,000+ over the duration of the projects. It begins… January 21 and runs to April 30, 2012 N-Gage Art!